A whining puppy can be both sad and annoying. But keep in mind just like a human baby crying, whining in puppies comes naturally, when she is cold, tired or hungry. Actually it is almost expected. When a mother dog hears her young puppies whining she quickly runs to them to provide either milk or warmth. They may just need her company to feel secure and safe. Puppies quickly learn to associate their whining with the quick return of their mother. This becomes the deliberate whine to let mom know something is wrong, or they simply miss her presence. 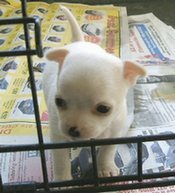 A puppy is generally between the ages of eight to ten weeks old when you adopt it. This is the time they learn that their whining doesn't work with her new human family. On the other hand she may learn whining is a manipulative tool to get the same response. If you respond to your whining puppy on the first night she is with you, paying her lots of attention by holding and petting or playing she will learn to whin longer and louder until she gets that attention. This is one reason it is reccommended you leave her alone from the beginning. Use your judgement and common sense here. If you have provided a safe and secure place for her she probably doesn't need attention. If you have a really paniced puppy, she may actually need your attention and some loving simply to distract her from the scariness of being in new surroundings. The trick here is to respond at the appropriate time. You don't want her to think it was her whining that got the response or you will be conditioning her that by whining she will get a reaction from you. This is where good timing come in. If she is working herself up into an all out whining, crying episode don't feel cold hearted by ignoring it. Yes you need to pay a bit of attention and calm her down, but wait until she is quiet. Realistically you probably can't wait until she has stopped altogether because there are some puppies that simply will not stop their whining. Stay close by and wait (it may be only a second you have to respond). Use that momentary second to show your presence, approach, open the crate door and give attention and calm her. Obviously this is not the best circumstances for dealing with your whining puppy but it may be your only alternative to stop any manipulating she is learning or has learned.